Today I am going to share with you one of my absolute strangest obsessions. Finding vintage duplicates. Now I know this may seem mad, and slightly odd, but honestly it never ceases to bring me pleasure to see that actually a vintage item I own isn’t the only one out there! 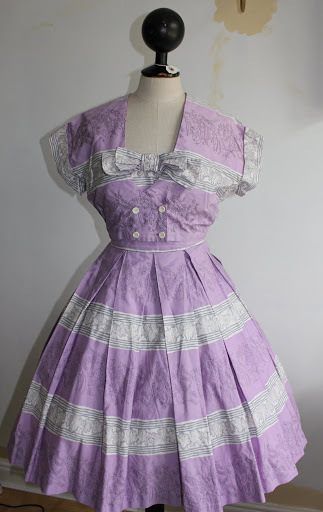 I know other people that HATE the idea that their vintage item isn’t unique, but i just like the fact that it reminds you that clothes were mass produced in the past! Also a little note on this dress. On the front of the dress you can see a little half sash section. 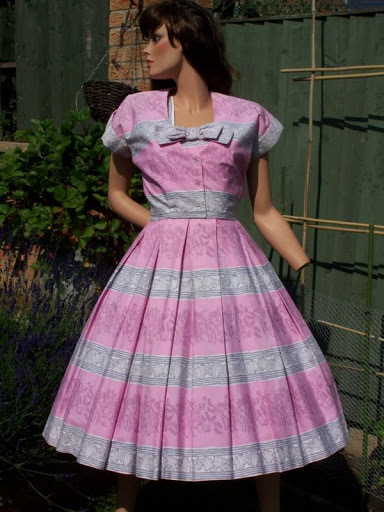 This is a real typical feature of Alice Edwards dresses and is always something to keep a look out for. Then I can get onto Horrockses. I have a sizeable collection of Horrockses (23 on my last count) and I have seen dresses I own appear on a number of occasions. 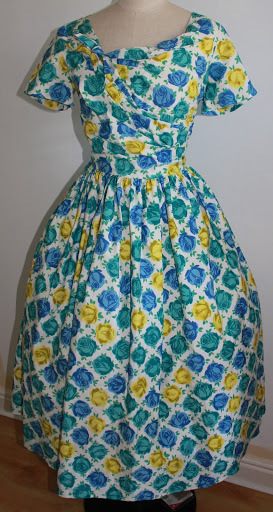 What is interesting with Horrockses is that they often used the same print fabric on different dress designs. 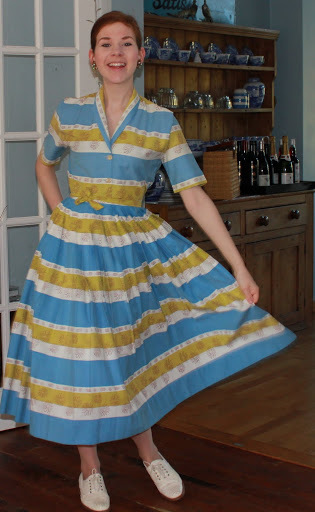 Sometimes you may even see a day time shirtwaister Horrockses and a full length evening gown Horrockses with the same print. This is one of my all time favourite Horrockses. The print is by Pat Albeck. Currently for sale on ebay is this stunner in the same print, but a bit more of a formal style. I reckon this must have been a pretty popular print as I have seen another 3 examples of this print (2 in a blue and green colourway and one in a just blue colourway). What interests me even more is that these dresses have different labels. Mine has the typical label seen up to 1958. 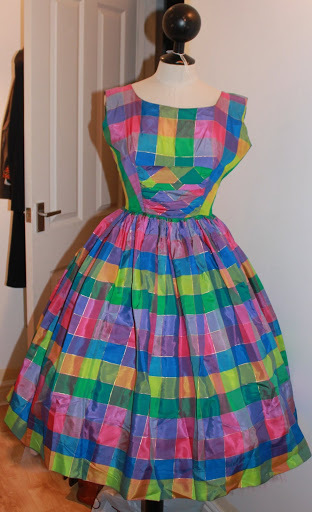 Whereas this dress has the label often associated with the later (though still collectible) Horrockses. Maybe this print was so popular it was used for more than one season? I’m getting to a point now that I am loosing count of how many times I have seen this Horrokcses print. I think this was the fourth Horrockses I bought, and is probably the one I wear most. I’ve seen this colourway design at least 6 times, and I have seen it in a paler pink version a few times too. There was a lovely one for sale at Vintage@Southbank. There is a wonderful pic of it here. 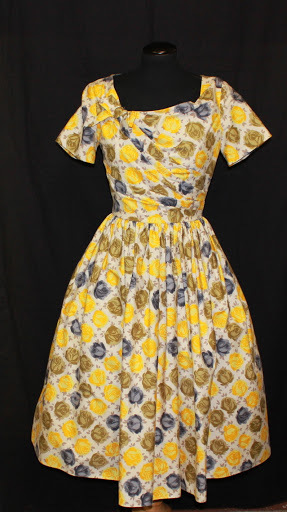 A dress in this print was one of the highest priced Horrockses ever to go on ebay (June 2011) sold by the seller brewery-house who has in recent months sold some of the most stunning Horrockses imaginable. And then I have these two wonderful examples of my own Horrockses which appear in other colourways with Hampshire Museums service. The one was my second ever Horrockses purchases and is my oldest one too (distinguished by its yellow and white rather than grey and white label which is almost papery). AND my example has set in sleeves. In all the Horrockses i have come across that i have been able to get close enough to study properly this is the ONLY one i have seen with set in sleeves. 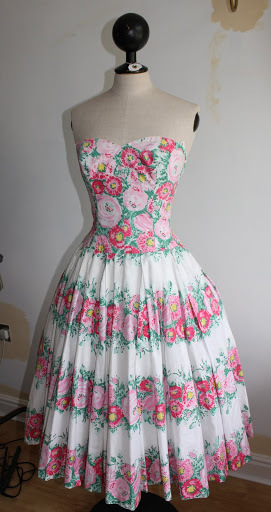 These Horrockses features the label normally associated with the late 50’s (as seen in the pink floral number above). Mine is the blue one and the yellow one is from Hampshire Museums service) Both of these dresses have absolutely wonderful colour combinations. What intrigued me most is that both my one and the one held by Hampshire Museum service are in amazing condition (both to me look unworn!) My example is particularly confusing as it has had its hem let down, yet there are no puncture marks in the fabric whatsoever to suggest it was hemmed in the first place. These aren’t actually all of my examples of duplicates i have come across but they are a few of the best! Yes, I like duplicates or variations, I once had the same black wool wiggle dress by Londonpride or MArjon or someone like that and the only difference was the neckline one had a vee neck trimmed with mink and the other was a plain scoop neck. AND I had them both at the same time but from different sources.I particularly like th pink and grey number above.